Crash Course is re:imagine/ATL's workshop where teens get to learn from industry film and digital media professionals. Together with Stilwell Casting, May's Crash Course bring you a workshop on how to cast and get cast. Stilwell Casting offers services for casting to actors and agents. In Casting the Act, you will learn how to prepare for an audition, what happens at a casting call, meet industry professionals to include an agent, acting coach, and casting director. Registration is required and lunch will be provided. This program is for teens. Early bird special until May 1st, $425 camp investment. On May 1st price will increase to $500. This year at The Green Room, campers aged 11-18 are creating a music video. Campers split into crews and create their own schedule, work with cameras, lights, and editing, and have access to artistic resources to create props, costumes, sets, and effects. Each crew works under the guidance of a staff of professional visual artists, filmmakers, creative tech experts and musicians. In this environment, campers experience the complete filmmaking process, ending in a screening of their finished products. Learn about the business side of film with the pros at Women in Film and Television at this workshop! The fee for this workshop is $25. Crash Course is a workshop series for teens presented by re:imagine/ATL. All teen and educator participants are welcome. If you need a reasonable accommodation due to a disability please email dani@reimagineatl.com This event is always free for teens, their chaperones and educators. Join re:imagine/ATL and the Atlanta Film Society for this FREE workshop on screenwriting! Get your ideas on the page and onto the screen. 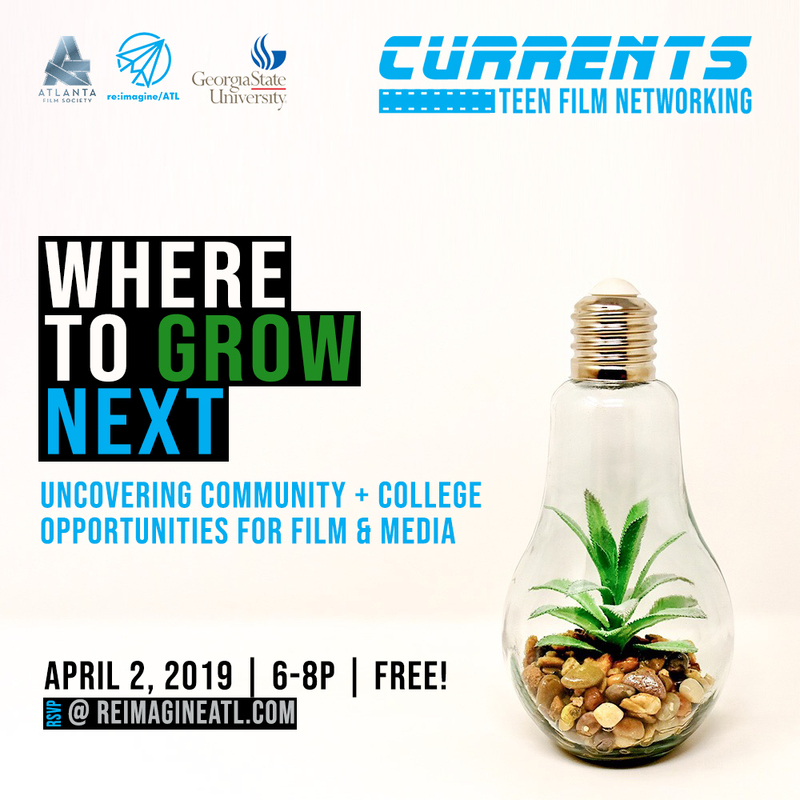 Currents is a monthly film networking event and workshop for teens presented by re:imagine/ATL and Atlanta Film Society. Currents seeks to create connections between Atlanta youth and the entertainment industry through networking and workshop-based learning. All teen participants are welcome. If you need a reasonable accommodation due to a disability please email dani@reimagineatl.com This event is always free for teens, their chaperones and educators. Is being an actor your dream? Join this free event to learn your rights and how to get into the industry. Members of the Screen Actors Guild will guide us through improv exercises and explain your rights as an actor and crew member. We'll hear from a panel of distinguished members as they share real world experiences getting into the industry. Currents is a monthly film networking event and workshop for teens presented by re:imagine/ATL and Atlanta Film Society. Currents seeks to create connections between Atlanta youth and the entertainment industry through networking and workshop-based learning. All teen participants are welcome. If you need a reasonable accommodation due to a disability please email terp@reimagineatl.com This event is always free for teens, their chaperones and educators. ADENA BRUMER: Adena is an Atlanta-area actor whose work ranges from local independent film to prime time television to web series and to theater. She also performs in several Atlanta-area bands, mainly as one-half of a contemporary acoustic pop duo (Wild Iris Rose), and also as the unflinching Valkyrie of a classic/modern rock cover ensemble (Rockin' Train). She is currently on the podcast, It Came From The Bottom, which reviews the worst 100 movies on IMDb - she doesn't recommend ANY of them. Adena, incidentally, loves to bake. She is a proud member of Actors Equity Association and SAG-AFTRA. KAREN CEESAY: Karen Ceesay is an actor, writer & producer in Atlanta, Georgia who can currently be seen as Mrs. Sinclair, one of “the Moms,” on Netflix’s “Stranger Things,” as Veretta Henderson on The CW’s “Black Lightning,” and still surviving the apocalypse, finishing her fourth season as Bertie on AMC’s long-running hit series, The Walking Dead. A lifelong theater enthusiast, Karen started performing at age ten, studying theater and dance at Freedom Theatre in her hometown of Philadelphia, Pennsylvania. Spelman College brought her to Atlanta where she graduated with a B.A. in theater arts. A long-standing member of Atlanta’s improv & sketch community started as a main stage cast member with Whole World Theatre. Since then she has performed with many of the local improv & sketch comedy troupes and served as emcee for Atlanta’s Women of Improv Benefit Show. An active participant in the Atlanta Film & Television community, Karen is a member of Georgia Production Partnership (GPP), SAG/AFTRA and served on the Board of Directors for Women in Film & Television Atlanta (WIFTA) for several years, overseeing the chapter's fortieth anniversary celebration. MATTHEW CORNWELL: Matthew is a textbook introvert. He has a nonchalant air about him and comes across as that guy you swear you remember from your home town. He's been acting since high school and picked up a Masters Degree in Mechanical Engineering along the way. He's called Atlanta home since 2000. In 2010 he married the love of his life, Brooke Jaye Taylor. If he had hobbies (which he doesn't), they would be drawing, soccer, and playing guitar. ALAN BOELL: Alan Boell is an actor, known for his role as Adams in Stranger Things. He has also known as a supporting cast member in Rampage, opposite Jeffrey Dean Morgan and in The Fundamentals of Caring, opposite Paul Rudd. Alan studied and graduated a two year Meisner program. He has also studied acting at the Chubbuck Studio in Los Angeles, CA. Alan is also a former Marine Officer, where he served for 9 years. He is also a sports fanatic and has played rugby both collegiate and for the military, he is a mixed martial artist who has fought both amateur and professionally, he also played semi-pro football. Alan also pursues his love of storytelling through his screenwriting, which he improves, by submitting to screenplay competitions. He is consistently developing, writing, and filming his own short films and skits. SYDNEY WEASE: Sydney Wease, born in Arizona, has lived the life of a "military brat" moving and traveling all over. Syndey even had the chance to live in Japan for a few years when she was younger. She started her acting career in Utah before moving to Georgia where she made her TV debut on episode 4 of the 8th season of The Vampire Diaries on The CW. ERIC GOINS: Eric is a father, husband, and accomplished actor with multiple television and film credits. His initial love for improvisation turned into a 20-year ride of performing and teaching improvisation, including 16 years of live performances at Whole World Improv Theatre in Atlanta, GA. Eric's television credits include The Originals, Army Wives, Meet The Browns, One Tree Hill, Drop Dead Diva, and Insatiable and Black Lightning. He also played LARRY on AMC’s Halt & Catch Fire (Season 1 & 2). Eric's film credits include Ride Along and Ride Along 2, The Watch, The Family That Preys, The Accountant, Dirty Grandpa, and Boss Level.